Never has the fine line between stupid and clever been so gracefully trod upon as in This Is Spinal Tap, which celebrated its 30th anniversary with a gala screening at the New York Film Festival, followed by a Q&A with co-writer/costar Christopher Guest. I’ve lost count of the number of times I’ve seen the film since its 1984 release, yet I still saw things I’d never noticed, and learned things I never knew. In honor of Nigel Tufnel’s amp, here are the top 11. 1. Guest and Michael McKean wrote serious songs years before forming Spinal Tap. The gifted musicians met when they were teenagers and had dreams of legitimate rock ‘n’ roll stardom before deciding to pursue careers in comedy. McKean was briefly a member of the baroque pop band The Left Banke in the ’60s. 2. There would be no This is Spinal Tap without Norman Lear. Guest, McKean and Harry Shearer had filmed some scenes of the band on their own but couldn’t get anyone to finance a feature until director Rob Reiner hit up his old All in the Family boss, who told him to go off and make the movie using his money. Reiner later paid it forward by giving Guest similar carte blanche to make Waiting for Guffman. 3. It took Reiner two years to edit 50 hours of footage down to the 82-minute film. And you can tell: There’s not a joke wasted, and despite the largely improvised scenes, the through-line about the break-up of best friends David St. Hubbins and Nigel Tufnel proves surprisingly poignant. Some of the outtakes have been released on DVD, and while they’re very funny, you can see why they were left on the cutting-room floor, since they didn’t advance the story. 4. Spinal Tap wasn’t based on any one band. Despite musicians coming up to Guest for years claiming the movie was inspired by them (including Jeff Beck, who thought he was the model for Nigel Tufnel), the filmmaker insists it all came from imagination. Which came as a great disappointment to a festivalgoer who was convinced the ever-changing drummer gag was a nod to Uriah Heep. 5. Don’t call it a “mockumentary.” Guest doesn’t like that term, which was coined by a movie critic. 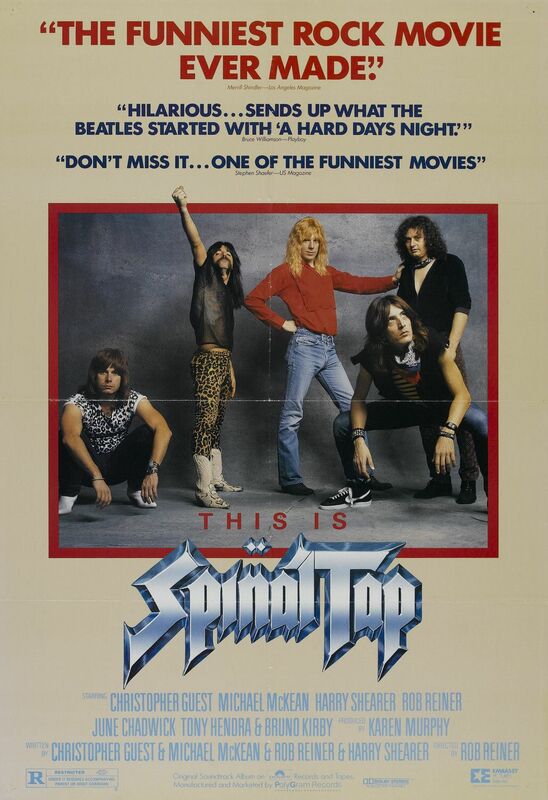 While he claimed that This is Spinal Tap was the first film to parody the documentary format, I’d argue that Albert Brooks’ Real Life beat them to it. 6. Legendary session musicians rounded out Spinal Tap. Drummer Russ Kunkel and guitarist Danny Kortchmar, two-thirds of the ’70s LA band the Section and backup band members for artists like James Taylor and Jackson Browne, appear in the film as doomed drummer Eric “Stumpy Joe” Childs and original bassist Ronnie Pudding. 7. One of Spinal Tap’s drummers suffered a real-life mishap. During the band’s 2009 reunion tour, Ric Parnell—aka Mick Shrimpton—fell down the stairs at a concert venue and broke his leg. He finished out the tour while wearing a full cast. 8. Anjelica Huston’s name is spelled two different ways in the credits. She’s initially credited for her one scene as the designer of the ill-conceived Stonehenge set piece as “Angelica Huston,” but her surname is correctly spelled during the crawl. A year later, she made a name for herself by winning an Oscar for Prizzi’s Honor. 11. Nigel’s amp gag was one of the few in the film that wasn’t improvised. Because the special knobs that go all the way up to 11 had to be built in advance, that joke had to be pre-planned. But it’s still one louder, isn’t it?